Welcome to the Ritz-Carlton, Cancun – the resort with the right balance that keeps kids busy, teens happy and parents blissfully pleased – leaving the whole family wanting more. I was looking for the ultimate family vacation: tropical and luxurious. But as the mother of two adolescent children, this can sometimes seem a quest as monumental as Odysseus’ journey home. A palm tree studded, ocean front location was a prerequisite, but I was worried that for my two hard-to-please teens, ocean breezes and warm waves might not be enough and the chant of the dreaded “this is sooooooo boring” would predominate our family holiday. What I needed was a resort that had the right balance of interesting activities that would entice my kids to give them a try, so that boredom wouldn’t have a chance to set in. My family and I have travelled to Mexico several times, but we had never been to Cancun. I had heard rumors that it had never quite bounced back from the damage that it sustained from hurricane Wilma in 2005, and that its famed beach was greatly diminished. Its reputation as a spring break party capital for college kids is legendary. Add the swine flu outbreak to the mix, and Cancun was not on the top of the list for family vacations. The fact that the state of Quintana Roo had not a single documented case of the virus seemed of little importance to many potential travelers. But, what we found was very different from the rumors that we had heard, and much to our liking, as The Ritz-Carlton, Cancun proved to be just what we were looking for. The hotel provides the impeccable service and comfort that you expect from a Ritz-Carlton property, paired with a stunning ocean front location. It has a staff that seemed to anticipate our every need. They are all English speaking, and put even the most timid foreign traveler at ease. If gorgeous, warm turquoise waves and powdered sugar sand are not sufficient to keep your kids happy, the hotel features some wonderful family-friendly activities that made our holiday a winner. If the sounds of the ocean hadn’t been so enticing, we might have never left the sanctuary of our ocean view, 7th floor room. We weren’t the only ones to enjoy this vista, as each of the hotels 365 rooms over-look the sea. It was furnished in a neutral palate that had a calming effect: understated, yet luxurious. Fresh flowers decorated each corner of our room, and they were as lovely as the grand floral arrangements that grace the hotel’s common areas. These large bouquets of roses paired with exotic flowers, came to sum up the hotel for me. The Ritz-Carlton, Cancun is as classically elegant as a rose, but you never forget that you are in a tropical paradise. 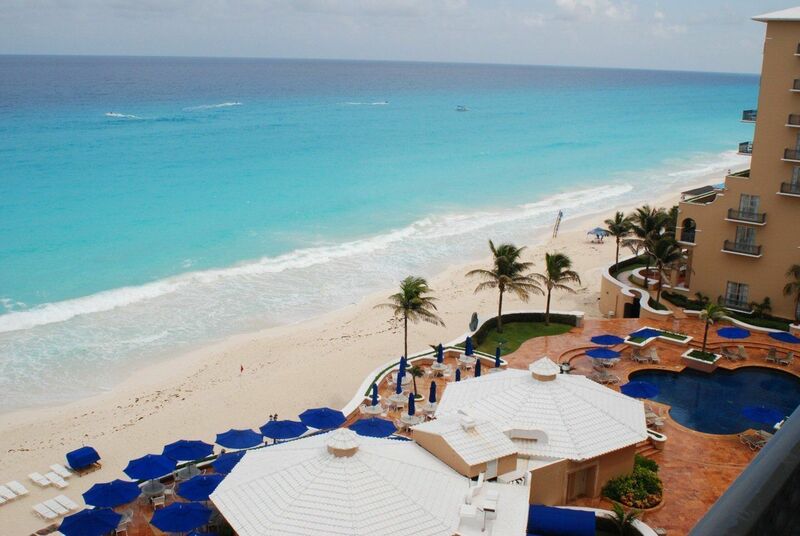 The view from our room quickly assured us why Cancun is such a popular destination. 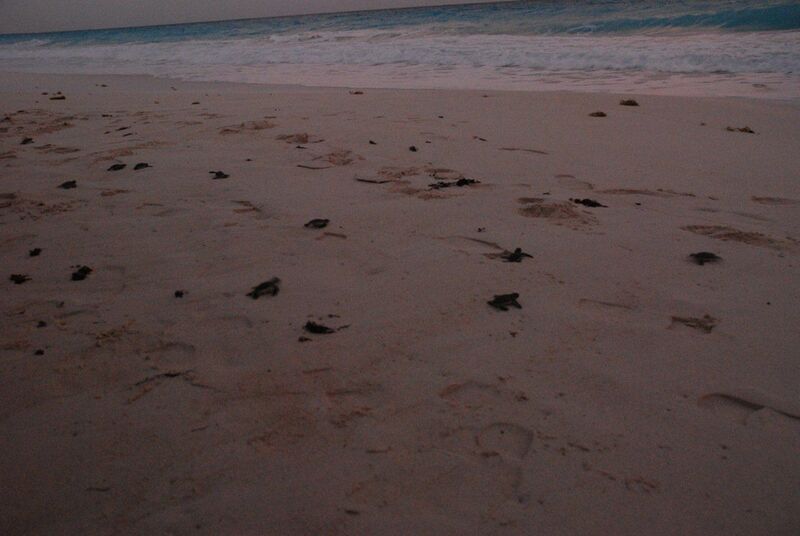 The ocean, with its crystal clear turquoise water juxtaposed next to the purest white sand was stunning. When we were able to leave our suite, the beach did not disappoint. The waves and water temperature were perfect, and my hard to please kids were in heaven. The Caribbean, in all of its salty splendor, has some tough competition from the hotel’s two pools. The giant family pool was the perfect place for the four of us to relax on body-sized rafts that float freely throughout the pool. My favorite swim took place in the smaller of the two pools. For a blissful hour, it was my private sanctuary. This did not go unappreciated, for at my health club in New York City, I consider myself lucky when I am able to squeeze into one of the jammed packed lanes, where traffic and stress level remind me of driving at rush hour. The water was so warm it felt like I was entering a Jacuzzi. I was surrounded by a gentle waterfall cascading on one side of the pool and the crash of the ocean’s waves on the other. As I swam with my goggles on, I was enchanted by the tiny, exquisite tiles that covered the pool in a palette of blue that mirrored the color of the sea. As I lifted my head to breathe, I had a view of a sculpted Mayan goddess, done by famed Mexican sculptor Heriberto Juarez, whose work is found throughout the hotel. My favorite of Juarez’s works is a totem pole-like statue, which is located inside of the hotel, magnificently situated in an atrium surrounded by endlessly long, dark green vines. The Ritz-Carlton, Cancun offers private beach villas for those seeking a heightened degree of privacy and service. We decided to splurge and rent one for the day. Cancun is as famous for the rapid development or more precisely over-development of its stunning coastline. But the Ritz-Carlton enjoys the luxury of having a pristine lot adjacent to the hotel, so the beach villas offer complete tranquility in an isolated setting. We made our way to a private palapa hut, where our personal attendant set up eight comfortable chaise longue for the four of us, one set in the sun, one set under the shade of the palapa. My daughter chose to spend some time in our private yellow hammock, re-reading the Harry Potter series. A rainbow of colorful ribbon-like cloth acted as sheer decorative curtains as they blew in the breeze. We were spoiled with drinks and cool fruit refreshments all day long. The Ritz–Carlton’s youngest guests may enjoy the Ritz Kids Mayan Adventures program, with full-day, half-day and kids night out options. The program has some nice nature activities, as well as the standard arts and crafts variety. My teens were too old for this, but we saw many little ones, ages 4-12, all around the property having what appeared to be a well-supervised ball. The Ritz–Carlton makes children feel welcome right from the get go, with a separate kids check-in, when they are given a knapsack filled with Mexican themed toys and sweets, and parents are given useful items such as children’s Tylenol. Each child is given a scavenger hunt map, a fun way for youngsters to get to know their way around the property. In spite of its refined elegance, children are warmly welcomed, and allowed to be kids. The hotel also caters to parents of infants and toddlers with its Itzy Bitzy Baby rooms. The hotel has three fully outfitted rooms complete with anything and everything new parents could need. The rooms feature a crib, rocking chair, changing table, diaper genie, bottle warmers and more. Offered at no extra charge, these rooms allow parents of tiny ones to travel light, as everything is already waiting for them upon arrival. In an age when airlines are charging for suitcases, these rooms represent savings as well as convenience. As I mentioned, my teens are tough customers, and I had been worried that a splendid beach might not be enough to keep them happy. One of the main reasons that I chose The Ritz-Carlton, Cancun was for its family friendly Culinary Center. The Culinary Center offers daily hands on cooking classes where guests can choose from Mexican or international cookery, in a beautiful facility complete with a stunning ocean view. We booked the class called Real Mexican. It was harder than we had expected to drag ourselves away from the beach, and my son chose to skip the cooking class in favor of napping by the sea. As soon as we met chef Rory Dunaway, we knew that we were in for a good time. Rory and his staff began by speaking a bit about the variety of regional cuisines in Mexico. We would be cooking (and lucky us eating) ceviche, enchiladas, and churros all washed down with margaritas. Though far from professionals, my husband and I really enjoy cooking. Chef Rory made preparing our meal fun for all levels of cooks, and we all enjoyed not having to wash a single pan. For younger children, The Culinary Center offers special kids only classes. Rory said that the Breakfast Class is very popular, with the kids preparing breakfast under his supervision, and the parents joining their offspring to dine on the finished product. For our family, it was a great way to spend some time together, and my sixteen year old son, whose idea of cooking is telling the counter people at Subway how he wants his sandwich prepared, regretted not joining us, especially when he heard that we got to eat the goodies that we had prepared. It was fun to see my daughter enjoy cooking, and in my fantasy world, she will be preparing meals for my husband and I for years to come. In the real world, we all look forward to returning to The Culinary Center to participate in the chocolate themed and Yucatan style cooking classes. The Culinary Center is extremely popular with families, some of whom participate in a different class each day of their stay. 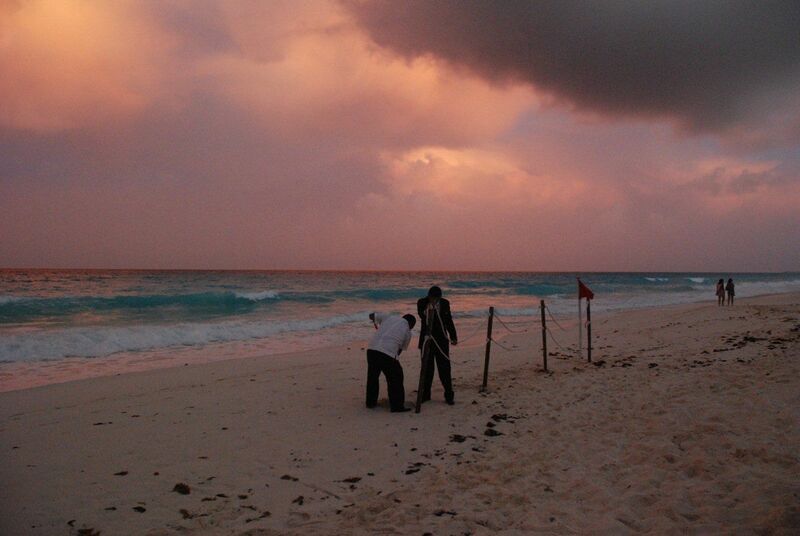 We were lucky to be guests of the hotel during summer, when its unique Turtle Guardian Experience is in full swing. From August thru November, the hotel prides itself on its sea turtle conservation efforts, with staff combing the beach looking for sea turtle eggs and hatching them in a protected environment. 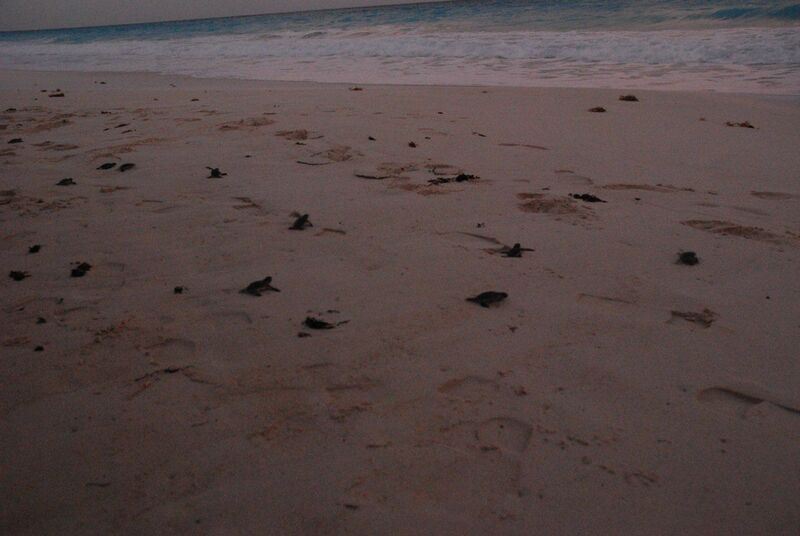 One evening at dusk, we joined the staff and other guests to ceremoniously release approximately 50 baby turtles that had hatched on the property back into the sea. Each guest was given a tiny sea turtle to hold, name, and all too quickly, say goodbye to. Sadly, we were told that very few of these turtles have a chance of surviving to maturity. Even the most cold hearted person would have mustered up a tear or two as the baby turtles raced towards the crashing waves, disappearing in the sea foam, becoming one with the ocean. It was an emotional experience for us all, and one that we will not soon forget. 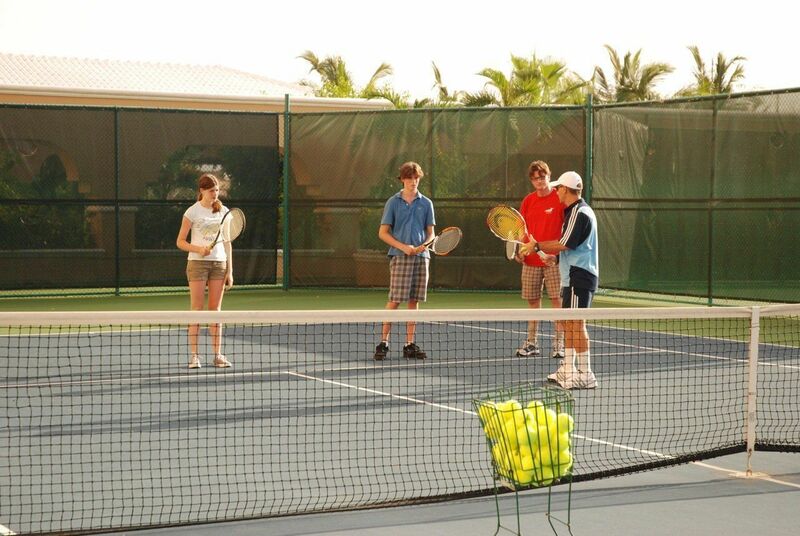 The hotel offers a free group tennis lesson each Wednesday at 5 pm. Nacho, our instructor, was full of energy and gave us all some excellent tips, and no one else showed up, so it turned out to be a private family lesson. The Cliff Drysdale Tennis Center provided us with complimentary rackets and healthy snacks and beverages. There are many dining choices on the hotels premises. We ate breakfast and lunch at the El CafÃ© Mexicano restaurant, where our table afforded us an ocean view. It had a chandeliered elegance, but we felt welcome and comfortable as we ate in our swimsuits and cover-ups, sandy feet and all. It features very good Mexican cuisine, but had a full selection of tame, kid friendly options, such as burgers and chicken fingers. We appreciated that the tortilla chips came with three salsas, each with a varying degree of heat. We all worked out at the hotel’s ocean view Fitness Center. While I cannot honestly say that I ever really enjoy working out, this was as good as it gets, with a super view, and staff members who handed me a eucalyptus scented towel and a chilled bottle of water at the first sign of perspiration. The hotel is home to a stunning spa with an array of Mayan and other services, but we were thrilled and sufficiently pampered with the complimentary steam and sauna rooms located in the fitness centers men’s and ladies changing rooms. Our stay at The Ritz-Carlton, Cancun was only a few days long, but it was so relaxing that it felt as if we had been on vacation for weeks. Its stunning location, super attentive service and old-world luxury make it a winner. 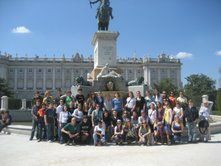 Despite its elegant and refined style, it never seemed stuffy, and my kids felt truly welcomed. To that add a bevy of family-friendly activities and I had found a resort that both the adults and teens in my family loved. Not once did my kids claim boredom, no small feat for a fourteen and sixteen year old. In fact, their only complaint came on the last day, when they begged to stay longer. Life cannot always be a vacation, but at The Ritz- Carlton, Cancun you leave wishing that it could last just one more day. You may be tempted to never leave the stunning beach, but if you can drag yourself out of the water, the Culinary Center is a wonderful family experience. 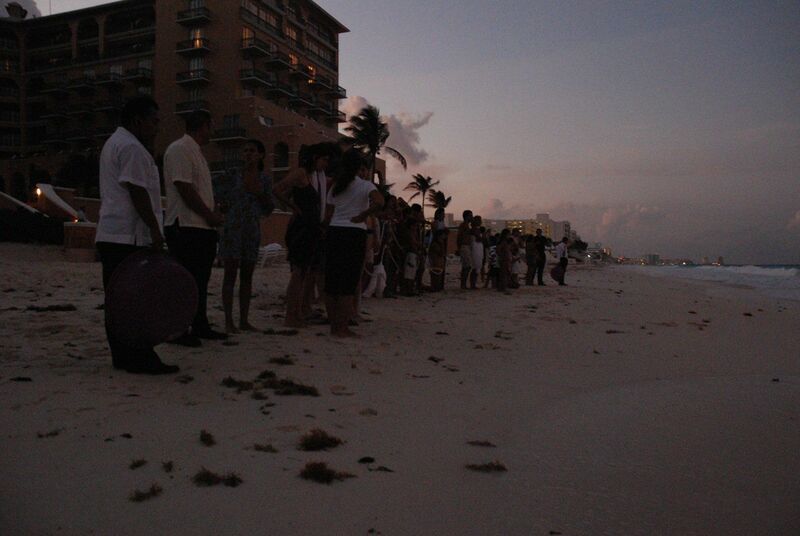 The Ritz-Carlton, Cancun makes genuine efforts to preserve the fauna of the region with its turtle release program.